Librarians who subscribe to our institutional content licenses now have some convenient statistical tools which summarize monthly page use and search terms. The statistical reports are only available to Librarians who have a personal management account with Exact Editions (typically the librarian who places the original order). When such registered librarians log in to Exact Editions with their username and password they will find a new “librarian: stats” link on the toolbar. This link takes them to our stats page, with traffic reports on each available issue (we stop at this level – we don’t show exactly which pages of each issue are being read). We also display the principal search terms used by the library’s members in any period (this data can be quite informative and is not intrusive — no individual data is logged). 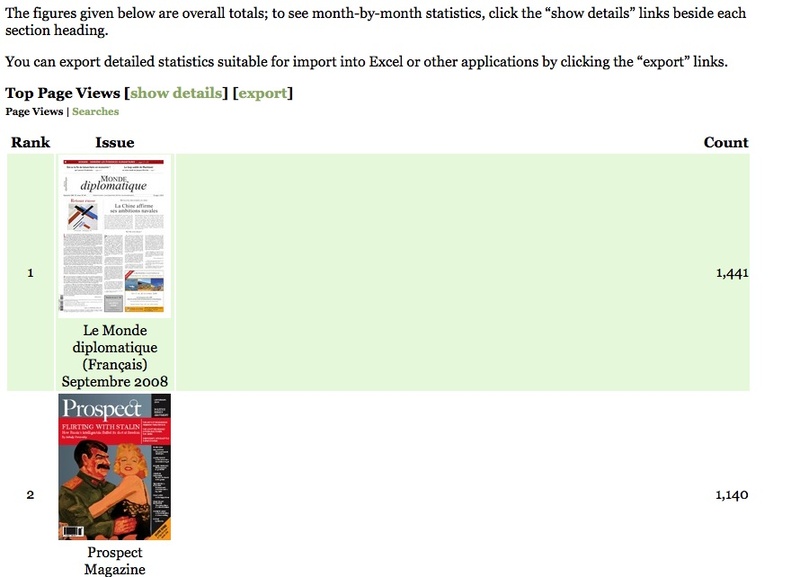 The figures are available by month, by issue, and by publication and can be exported to Excel.